Southern Cornwallis Island Nunavut Canada had several days, almost a week without clouds, adjusted my eyesight well, but what I saw verged on the impossible, or the possible but never noticed. 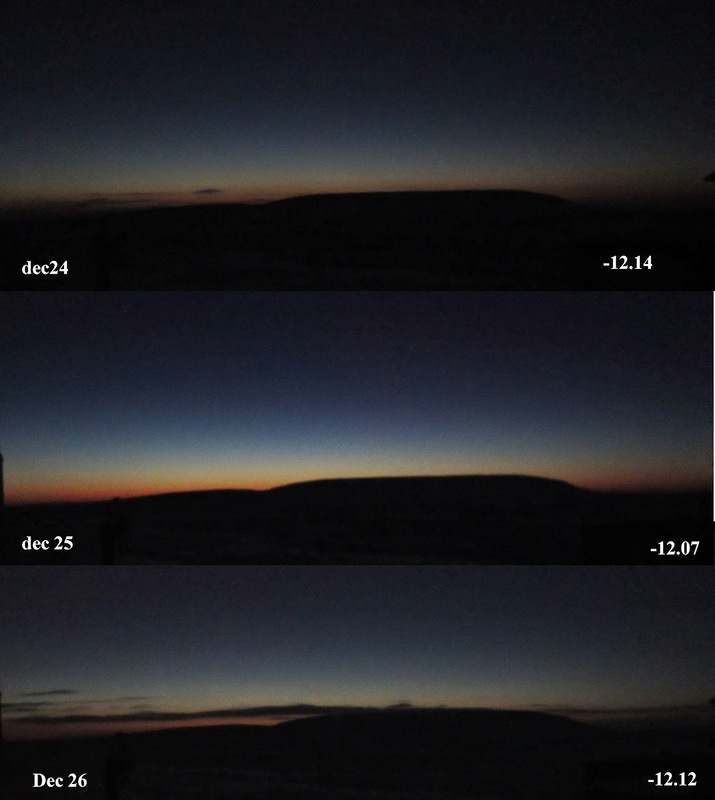 The picture with layered segments above are of the same twilight, except the first one (top), was taken earlier on December 22 2014, more to the East towards the sun position, the two others below were taken in the same direction towards the sun azimuth location later in the afternoon of December 24 (middle) and 25 respectively. As weak as twilight appears here, it was in fact brighter to the naked eye. But the same camera was used in order to demonstrate and record this refraction event. 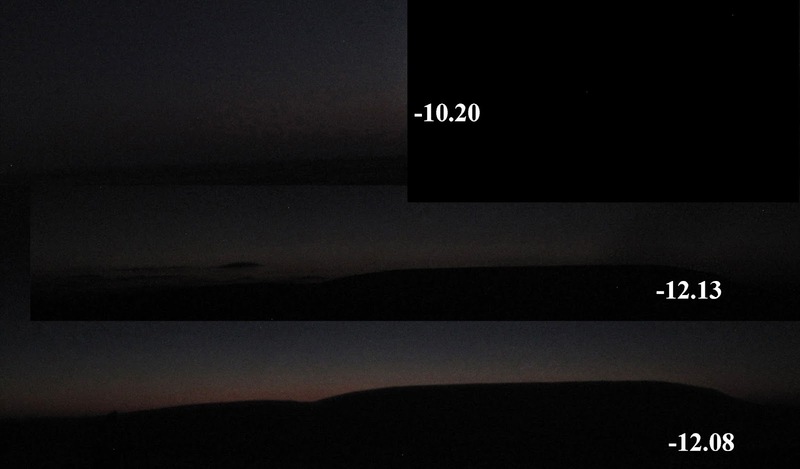 The first segment was taken when he sun was -10.20 degrees below the horizon. It seemed normal or close to the average twilight look at -10 degrees. What caught my eye was the second segment, at -12.13 degrees the horizon twilight was brighter than at -10, a fantastic re-discovery (the Y-V Ulluq Q), but this time captured with identical digital camera settings in every way. It is hard to accept that a much lower under the horizon sun can produce more twilight in clear skies. But horizon refraction often does so, but in this case can be considered a wow moment. The physics involved require a deeper understanding of how much heat this cyclone carried. Heat and cold are a major component of Atmospheric refraction. However, for North Eastern Americans and Canadians it was more heath than usual. Further to the South an important cyclone has moved from the South Eastern US December 23 all the way to Central Quebec on the 25th of December. Some called it "Santa Bomb". As this cyclone approached the Arctic the twilight brightened. In fact brightest on the 25th. The second camera used replicated vision much better, this was the 24th, the cyclone approached polewards and injected a lot of heat, this heat overlay over Arctic colder but seasonal air and caused an inversion interface at likely 2 altitudes, one on the ground, and the other at the maximum temperature in the upper atmosphere. On the 25th the horizon with sun at same altitude was remarkably brightest, a Christmas like none other for long night people. one pressure system so far away may have. I believe that this storm had more to it than calculated. greatly, under a steady high pressure ridge. The only variant was the Low American North Eastener heading off its usual Ireland and UK track towards the Pole. Camera 2 sequence, on day 24 the Low was further away NE USA, day 25 maximum illumination due to closer proximity of Santa storm still warm (central Quebec). Day 26 fading, the storm lost a great deal of energy on its way to Hudson Strait and thus the interface dT's, temperature differences were lesser, from here on Arctic twilights will vary less bright until the next warm massive cyclone Polewards. 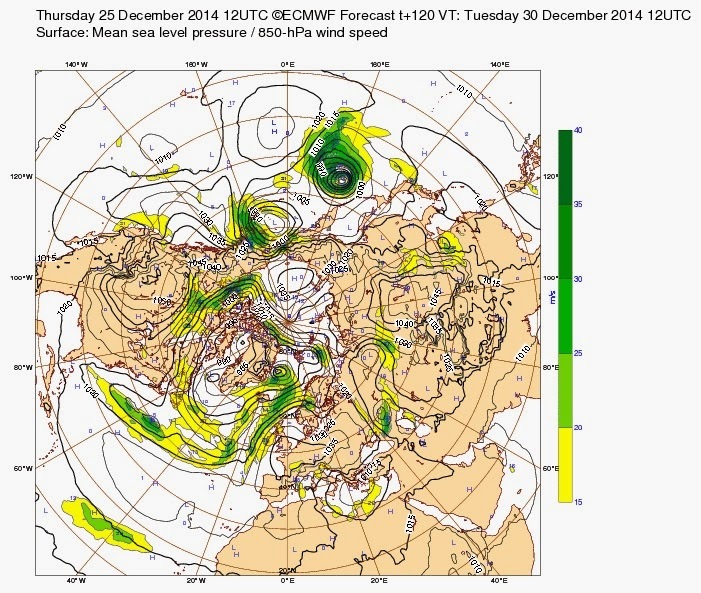 Just How much more energy did the "Santa Storm" carry? High pressure ridge near Cornwallis offered no apparent clash to the titan much further South. was correctly evaluated the forecast would reflect this measure of accuracy. total amount of energy a week prior.